What a find - exuberant Arkansas plate cluster, sparkling drusy base, another whole plate cluster artfully cantilevered above, and green chlorite PHANTOM crystals with SAND in them, too - not tan chlorite in this one. You'll really enjoy dusting your loupe off for these kids. 2-1/4x 4x 1-3/4" to the top, you can see through the two plates from front to back if you're so inclined. 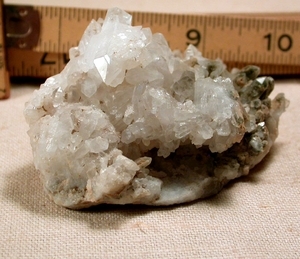 You'll notice a paper-thin 1/2" long doubly-terminated crystal with a pale olive green sideways comma in it; lustrous clear and veiled crystals including a twinned doubly-terminated one 1-1/4" all penetrated, a completely regrowing socket amongst the phantom points, and next to that socket, a rare rare rare CURVED 1/4x 1/2" phantom. No damage. Ain't we got fun!